In an era when pro-wrestling began to change because of the popularity of television, Michele Leone became one of wrestling’s biggest stars of the time due to the new medium. In Southern California where he enjoyed the most success he was the most popular wrestler in the territory, even bigger than Gorgeous George, and in May of 1952 he would wrestle Lou Thesz in what was wrestling’s first ever first ever $100,000 gate. Michele Leone was born on June 8, 1909 in Pettorano in the province of Abruzzi, Italy the son of a building contractor. Though his parents disapproved of it, Michele began wrestling at a very young age. According to Michele he was the champion of his area by age 14. As Leone began to get better, he started to earn cash prizes and he would then reinvest some of the money in wrestling lessons. Though no records of his early European matches are known, reportedly he began to become pretty well known throughout the continent. In the 1930s Michele Leone even traveled to South America to wrestle, but there is even less known about his time there than his European matches. In early 1938 Michele Leone came to New York City in the United States, and almost immediately resumed his wrestling career. On May 2, 1938 Leone defeated Mike Kilonis in the opening match of a card at New York’s Hippodrome. A little more than a month later he would be in the main event. On June 28, 1938 Michele Leone wrestled his first known American main event, wrestling Dr. John (Dropkick) Murphy at the Fort Hamilton Arena. Leone would move up and down the card several times throughout the next couple of years before making the Washington DC territory his home in 1940. Michele Leone debuted for Joe Turner’s Washington DC territory on June 13, 1940 working the opening match against Mickey James. Leone would not get the fast push to the top that he received in New York in Washington, as it would be two years before he made it to the top of the card in DC. While Leone was wrestling for Joe Turner’s promotion, the United States entered World War II, which ended up being a big break for Michele Leone. Not only was the United States now at war with Italy, making Leone a natural heel, but since he was still an Italian citizen he could not be drafted into the military. With quite a few wrestlers going off to war, that opened up more spots on the card for Leone. event of a show headlined by Jim Londos wrestling Tommy O’Toole, in a match that was said to have stolen the show. On July 1, 1942 Leone and Plummer met in the main event before approximately 1,000 fans at the Turner Arena. Leone cheated throughout the match, gouging Plummer’s eyes, pulling his hair, illegal use of the knees, etc. Leone stayed on the offensive throughout the match, and managed to win in 16 minutes with a body press then the pin. Leone continued to headline the Turner promotion throughout the next couple of years, as the attendance began to rise with each passing show. Two weeks after drawing 1,000 in his first main event, the attendance was up to 1,100 for his victory over Hans Kampfer, a German. To further show what an excellent bad guy Leone was, he worked the match as heel, against a German, during World War II. Leone even won the match with what he called a Japanese leg lock. For a match with Ernie Dusek on August 26, 1942 attendance at the Turner Arena was up to 1,800. Against Dusek Michele Leone actually shaved the “V” for victory into his chest, and explained to the crowd how Italy would win the war. Dusek was able to win in 30 minutes with an airplane spin. November 11, 1942 would see Michele Leone lose to Gino Garibaldi in the main event at the Turner Arena. Almost a decade later in Southern California one of Michele Leone’s top feuds would be with Gino and his son Leo, however on this date they only drew about 700 people. Over the next few years Leone would slowly move down the card and become mostly stuck as a mid-carder in Turner’s promotion. In 1945 with the war at it’s end Leone left the promotion and began to work shows all over the East Coast. Leone continued to work various areas, including Philadelphia until 1947 when he returned to Europe. Leone returned from Europe in 1948 and resumed working all over the East Coast. Leone returned to Turner Arena in Washington DC on January 19, 1949 to be defeated by Gorgeous George in the main event of a show that featured Stu Hart on the undercard. Leone would wrestle George again on May 12, 1949 in New York in a bout that was shown on WPIX TV. In October 1949 Michele Leone would come to the Los Angeles territory, where he would find his greatest success, and become Baron Michele Leone. In Southern California Leone had to once again work his way from the bottom of the card, to the top. By November 1950 Leone was already the biggest star throughout the Los Angeles territory, and on November 22, 1950 he would meet Enrique Torres for the Olympic version of the world title at the Olympic Auditorium in front of a reported 10,400. Leone was able to capture the second and third falls of the match to win the title that Torres had held for nearly four years. On May 21, 1952 Baron Michele Leone made wrestling history, when he lost the Olympic version of the world title to Lou Thesz at Gilmore Field in Los Angeles, unifying it with the NWA world title. The event drew 25,256 fans, which is still to this date the second largest crowd to watch a wrestling event in Southern California history, and took $103,277.75 at the gate, pro-wrestling’s first gate of over $100,000.00. Athletic Commission when a false report on the amount wrestlers were paid was filed with the Commission. At the time the California state government required that promoters turn in sheets showing the purses that the wrestlers received for the match. The sheet that Aileen LeBell Eaton turned in to the state showed that Baron Michele Leone received $10,000.00 and Lou Thesz received $12,725.00 for the match. When the state auditor checked the Olympic booking office records, and Leone’s income tax records, it was discovered that Leone had only received $6,650.00 for the match, $3,350.00 less than was reported to the state. The auditor also found that Thesz was only paid $9,000.00 for the match. It is not known what type of penalty, if any, was the Olympic office was given. In June 1952 Leone had to testify in court when Ian H. Caldwell and his wife, Mary, of West Los Angeles filed a suit against him and Enrique Torres for $30,000.00. The Caldwells claimed they were injured when Leone tossed Torres from the ring at the Ocean Park Arena in Santa Monica during a match on January 5, 1952. In court Leone testified “If I could forward pass a man like Enrique, I’d quit wrestling and try for the USC football team.” The case was eventually thrown out. Despite losing the world championship Leone remained the top draw in Southern California, and on December 17, 1952 Leone defeated Rito Romero in two out of three falls before 6,800 fans at the Olympic Auditorium the win the Pacific Coast heavyweight title. Michele Leone defeated Danny McShane for the NWA World junior heavyweight title on August 16, 1953 at Legion Stadium in Hollywood. There are also reports the title change took place in Memphis, TN or Amarillo, TX. With his popularity from television, Leone was taking bookings all over the country, and from 1951 through 1953 he was a semi-regular in the Georgia territory as well as being a regular in Los Angeles. However by 1954 Leone had pretty much left the Los Angeles territory for Texas, where on February 16, 1954 in El Paso, TX and October 13, 1954 in Tulsa, OK Baron Michele Leone unsuccessfully tried to recapture the world championship from Lou Thesz. Also in 1954 Michele Leone married his wife Billie, who in Leone’s own words was “no fan” of pro-wrestling. On February 25, 1955 in Miami, FL Baron Michele Leone challenged Lou Thesz for the world championship for the last time. Shortly after Leone returned to Pettorano, Italy along with his wife. Leone and his wife decided to stay in Italy for a while, and Leone retired from wrestling. 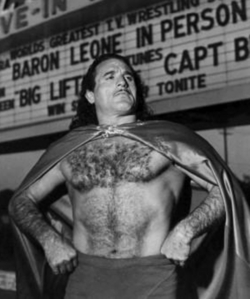 Baron Michele Leone, who was independently wealthy from his days as a pro-wrestler, eventually returned to the United States, and moved back to the apartment building he owned in Santa Monica, aptly called “The Baron’s Castle.” Leone spent his retirement swimming in the Pacific Ocean, jogging on the beach, and traveling frequently with his wife. Baron Michele Leone was hit by a car while crossing the street in a crosswalk near his home on November 14, 1988. He died at UCLA Medical Center on November 26, 1988 of head injuries suffered during the accident. He was survived by his wife Billie. The Leones had no children. Notes: It is not currently known if Michele Leone lost the Pacific Coast title and the NWA World junior heavyweight title in the ring. There is some dispute as to what city Leone won the NWA World junior heavyweight title in. The research of wrestling historians J. Michael Kenyon and Steve Yohe. Tribune, and The Oxnard Press-Courier.